What began as three friends’ kindness and compassion to help one athlete paralyzed in triathlon has now grown into a powerful current that has carried and supported those with physical challenges – empowering them to find community, confidence, and conviction. The mission of the Challenged Athletes Foundation (CAF) to provide opportunities and support to people with physical challenges, so they can pursue active lifestyles through physical fitness and competitive athletics. The Challenged Athletes Foundation believes that involvement in sports at any level increases self-esteem, encourages independence and enhances quality of life. Since CAF began, over 100 million dollars has been raised to support the athletes. Bob Babbitt started racing triathlons win the late 1970’s. 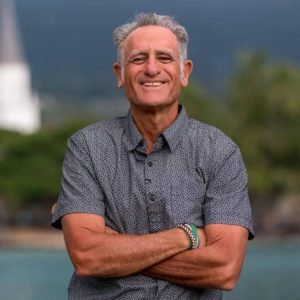 He did his first Ironman Triathlon in 1980 on the island of Oahu and ended up completing five more when the event moved to the Big Island. Bob is in both the Ironman Hall of Fame and the USA Triathlon Hall of Fame. Bob co-founded Competitor Magazine and the Challenged Athletes Foundation, plus he created Competitor Radio and the Muddy Buddy Ride and Run Series. Bob does many things including operating the Babbitt Media Group and Babbittville Radio and Babbittville. Bob has also hosts a weekly radio show airing out of San Diego called Competitor Radio. History of Babbittville Radio, Challenged Athletes Foundation, and Bob Babbitt. The importance of possibilities over probabilities. Taking the gloves off and not coddling those that are adapting to something challenging. Sports are opportunities to all. Commonalities in the responses of non-adaptive and adaptive. The importance of Competitor (began as a magazine) and the growth of adaptive sports. Bob Babbitt shares some rad stories from his experiences with Challenged Athletes Foundation. Book Mentioned in the Interview “Redemption: From Iron Bars to Ironman"
The Challenged Athletes Foundation and Bob Babbitt's websites and social media links are below. The Challenged Athletes Foundation® (CAF) is a world leader in helping individuals with physical challenges get involved – and stay involved – in sports. CAF believes that participation in sports at any level increases self-esteem, encourages independence and enhances quality of life. Since 1994, more than $100 million has been raised and over 23,000 individual adaptive sport grants have been given. Whether it’s a $2,500 grant for a handcycle, helping underwrite a carbon fiber running foot not covered by insurance, or arranging enthusiastic encouragement from a mentor who has triumphed over a similar challenge, CAF’s mission is clear: give those with the desire to live active, athletic lifestyles every opportunity to compete in the sports they love.